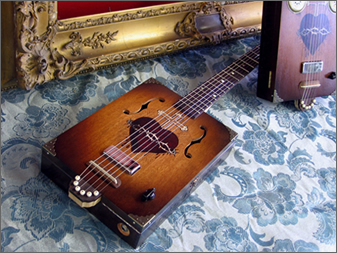 Daddy Mojo builds handcrafted guitars from cedar and mahogany cigar boxes. The instruments, which are smaller and lighter than standard guitars, sell for between $265 and $735 and have found a following among blues aficionados who can’t get enough of the warm sound they provide. The guitars originated as a form of “do-it-yourself” instrument and were used by soldiers during the American Civil War. The practice carried through to the 20th century with poor blues musicians in the Deep South making their own guitars out of discarded cigar boxes and fish wire because they couldn’t afford any other kind. Daddy Mojo’s present-day incarnation is of better quality than its bare-bones forerunner, but company co-founder Lenny Piroth-Robert says the irony of making an instrument that was born in hard times isn’t lost on him. “It wouldn’t surprise me if it’s something that makes its mark these days, because it’s really something that came out of a time when people didn’t have much money and had to be creative,” Piroth-Robert said. Since its inception in 2006, Daddy Mojo has made more than 1,000 cigar box guitars which have been shipped all over the world or sold through retailers in Canada and the United States.